Momma Told Me: Why should I pay $300 for video games? I know I don't have to remark about how 'when I was a kid' video games were a collection of visible pixels bouncing back and forth on a 12 color screen display. It's no secret the plight of parents installing endless batteries into over-complicated toys has been answered, for better or worse, by the surge of modern gaming console systems. Now, instead of yelling about the monster truck left on the stairs you enjoy the rant of a mother who found the $65 gaming disc face down in the cat box. (The joys, right?) Or, perhaps you're simply a millennial longing to get back into gaming, yet struggling to find the space in the budget for a several hundred dollar system, that may or may not get used often. 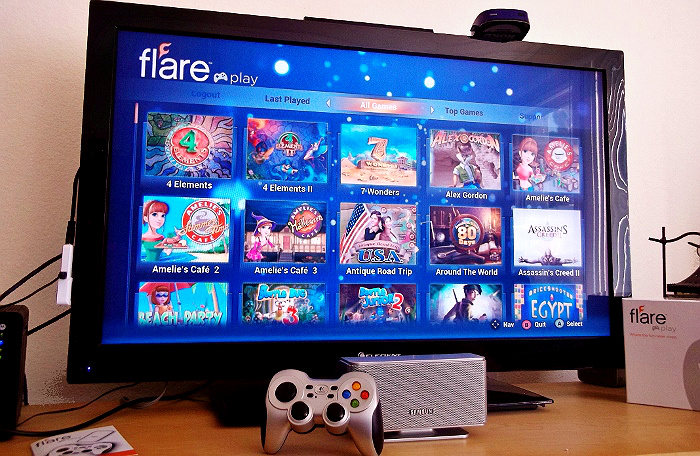 For individuals, everywhere, who struggle to justify the cost of digital entertainment at home, yet still wish to satisfy that craving, cloud based gaming consoles such as Flare Play have been introduced to the consumer market. Now, I own a different cloud based system, which initially cost me a $139 investment to get set-up. 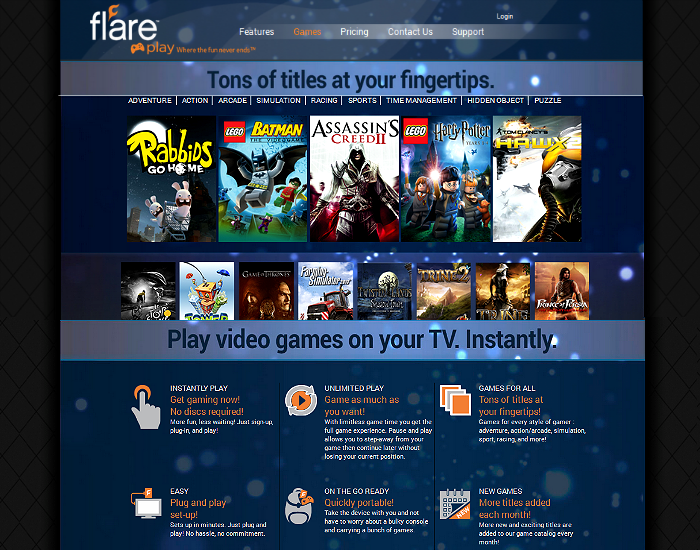 Flare Play, a literal plug in and play gaming system uses your online subscription account (for a low monthly cost) to provide an ever growing library of video games through your wireless connection to your micro-console. What does all this gibberish mean. 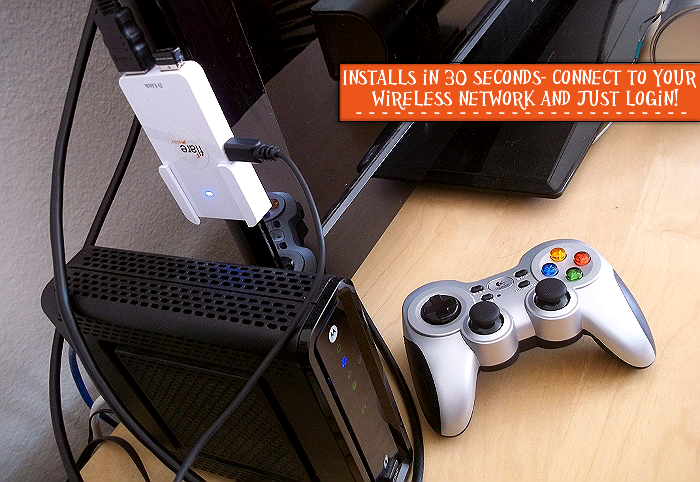 Buy a small, easy to set up, Flare Play micro-console for a one time flat rate (regularly $99.99), pay a low monthly fee (anticipated to be $9.99/month, like GameFly), and enjoy non stop gaming access at any TV or screen within your house. 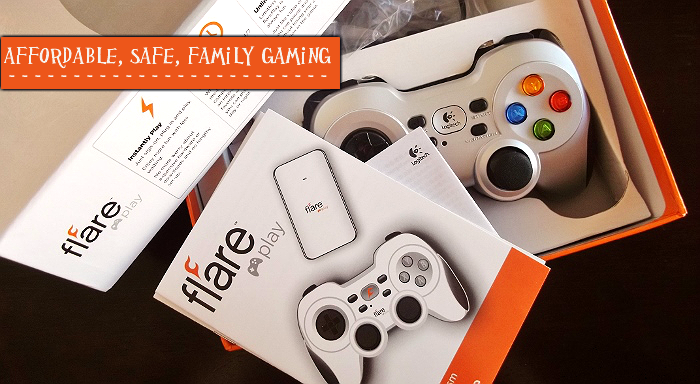 Flare Play even includes a Logitech gaming controller with multiprogramming and vibration technology. 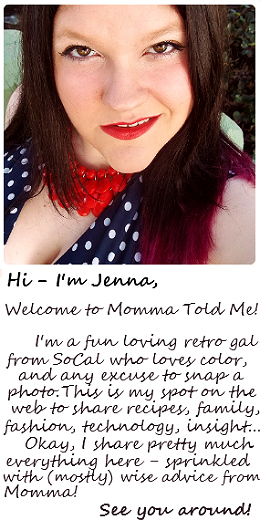 I recently ha a chance to text drive Flare Play, in BETA for households within California. I immediately noticed sever positive differences over their competitors, including the instant wireless setup. Other micro-consoles will often need to be hard-wired to a modem, which can cause unsightly cables and limit the ares where the console can be used. The WiFi connectivity of Flare Play means it can be used in ANY room within your house. When I unpacked my Flare Play I was impressed with the small footprint and simplicity of the design. The micro-console itself is about 4x2x1", and includes a simple sticky mount to attach to the back of your TV. The included wireless gaming controller comes with 2 AA batteries for operation, though I sapped these out for rechargeables of my own, and is instantly paired to the microconsole via a USB communication receiver. To better illustrate, I unpacked the console, HDMI cable, power cord, and controller, plugged both in, flipped on my TV and had instant access to the Flare Play system. Naturally, you must register for a player account and monthly membership first, which takes a few minutes, then all that is left is to log into your account through your console. Because the gaming is all connected to your account, any save information in the gaming library will be saved to the cloud; your save capacity is only limited to that built into each game. Flare Play is still going through BETA, so the initial 100 game library is not as licensed as I would like, but the price is still more than a fair bargain. The company promises to add new games each month, and the diverse library already features big name titles like Assassin's Creed II, Harry Potter Lego, and Rabbids Go Home! Games cover everything from racing and puzzles to simulation and action, with multiple age groups, so the whole family is sure to find something they want to play. And, right now, California residents can take advantage of an exclusive online, blog, offer and purchase their Flare Play gaming system just in time for the holidays, at an amazing price. Get a Flare Play micro-console, with Logitech controller FREE with the purchase of a 3 month subscription for just $30.00! 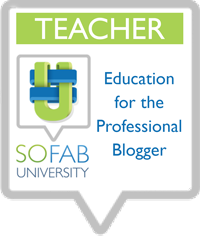 Simply click this exclusive blogger Flare Play subscription link to get access to this amazing deal- there are only 250 accounts available at this price, so don't wait! 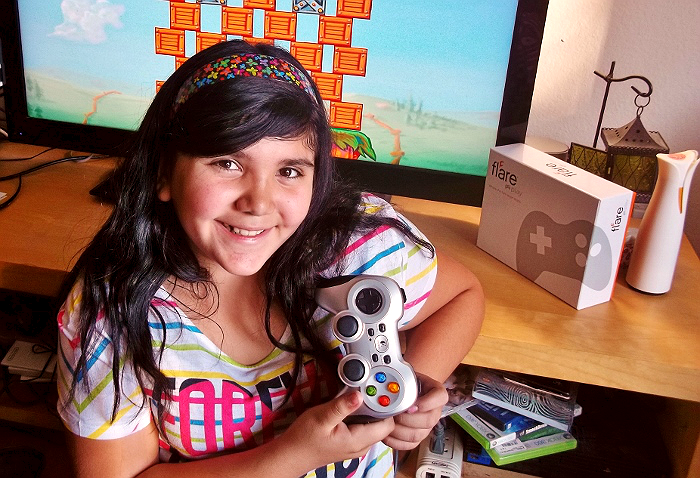 We have had a blast with our Flare Play gaming system and service; each of our family members has fallen in love with several of the games, and I love how safe it is for Sabrina (11) to use. She can easy tote it from the living room to her room for play time, and we can't wait to see what new titles will pop up next month! It's hard to ignore that some families simply have to have the big brand systems; and Flare Play is a wonderful alternative for those who can't afford them, but this system is also a great add-on for households that do as well. My only desire for Flare Play, at this moment is a future opportunity to extend gaming controllers to 2 player connectivity for siblings and family play. Otherwise, you simply cannot beat the exclusive $30.00 introductory price for this micro-console and 3 months of unlimited access to the ever-growing 100+ title gaming library! 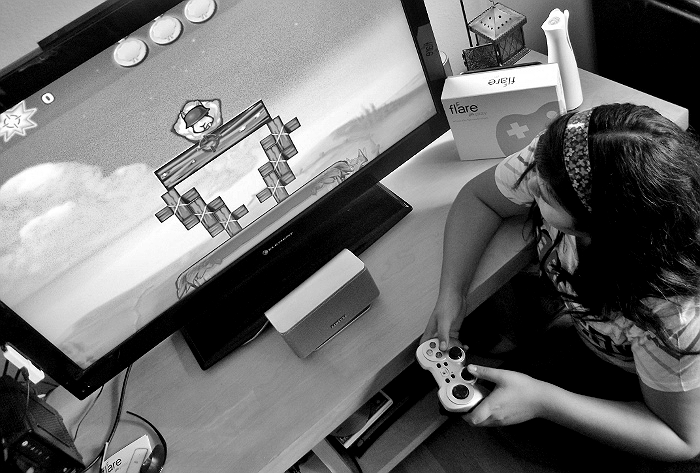 What Daughter Says: Compromise with the gamers in your home and invest in the affordable, instant, Flare Play system. 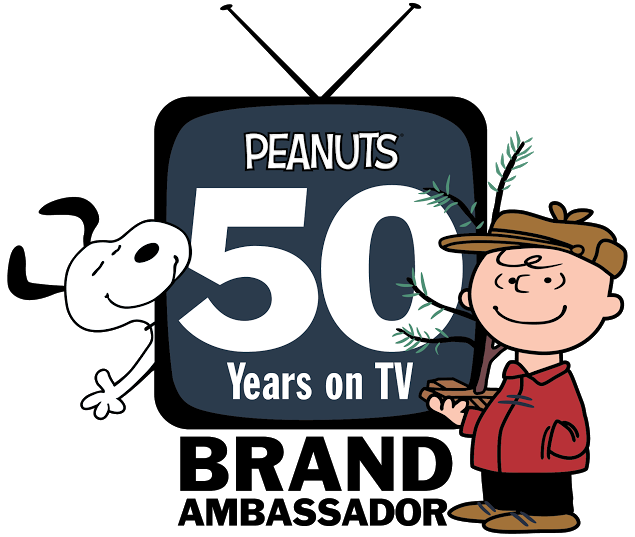 I've never heard of this but seriously checking it out. My biggest complaint about all the games is the fact that my kids leave them scattered around the house. At $20 to $40 per game, it gets pricey when those little games get lost!! This is a great alternative, and a way to keep the gaming fun and fresh. I like that this is so easy to install. Some of the new technology is just way too complicated! The simplicity of this is nice! I also like that it isn't a bajillion dollars. Looks like something to consider here! Sounds like if you have gamers in your family this would be an excellent gift! I've never heard of this but it seems cool! I'm not a big gamer but I know some friends who would love this! That introductory price seems amazing. I know we invested $1000s in games for our kids. This looks like a great system. I'm going to tell my husband about it. I love the idea of online gaming instead of losing game discs all over the house. I need to try this! What a fantastic price! website for the game, here you find many kind of games and get good knoeledge about ps5 games. Hurrah! I have once again landed on an exclusive offer to play video games and learn about them easily. I am a great video game fanatic. 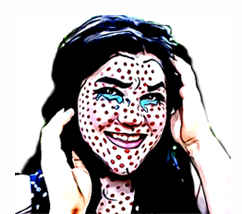 Please give me FreeGameMemberships. Notice how I didn't put "males" after female for strong? That's because males in games are ALWAYS represented as strong and smart. In the event that we are searching for arrangement of videos games,unblocked games they are comprehensively isolated into eight noteworthy classes.